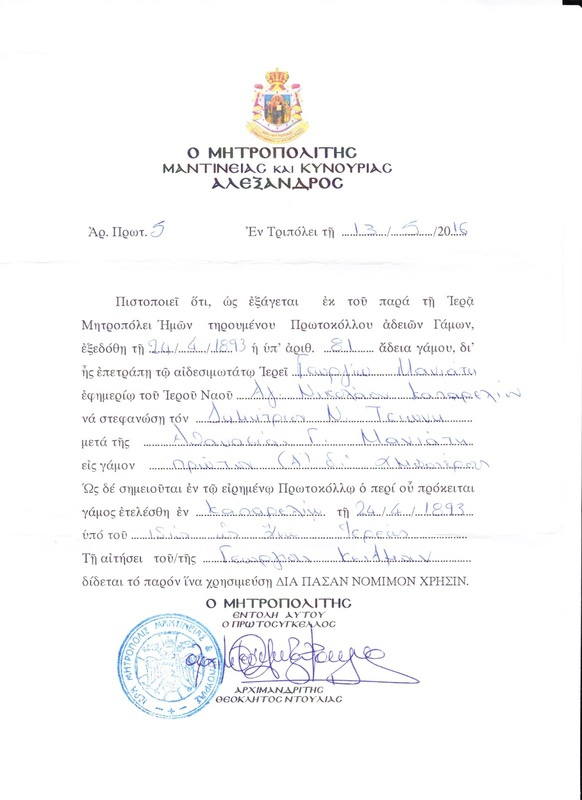 I decided to write to the GAK, General Archves for the region of Tripoli, Greece using a form letter I had purchased years ago from Lica Catsakis. 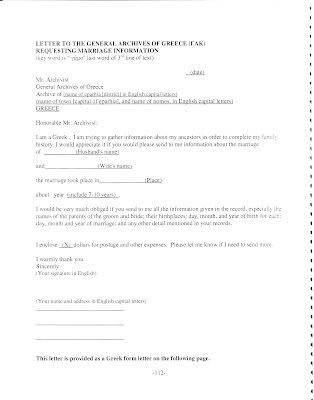 In order to read the following documents better, you can save a copy to your computer then enlarge them to your hearts delight so that you can see them clearly. 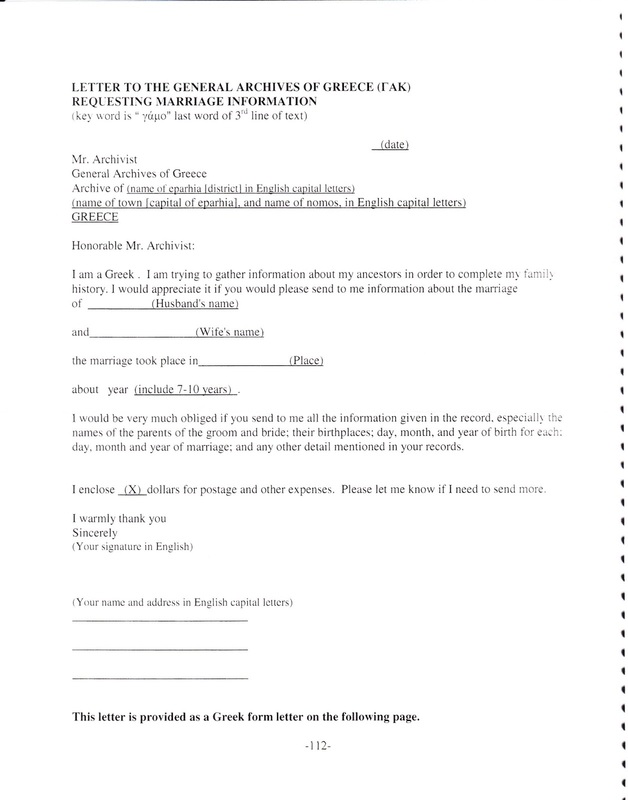 Below you will also find a blank English form translation that was provided by Lica Catsakis. Last week I received the response along with my $20 and a note stating that it was their obligation to do this for me and I didn't need to send the donation. 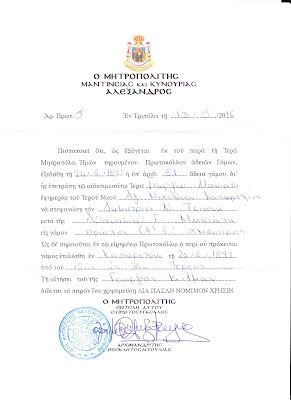 Not only did they confirm the maiden name of my great grandmother as Maniatis, but now I have the date of their marriage and the fact that it may have been her father, Georgios Maniatis, that performed the ceremony. I say "may have been" because there were several Georgios Maniatis at the time. I have always found the people working in the Mayor's offices or the GAK to be very helpful. 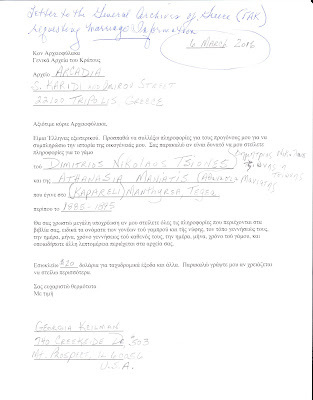 It does help to try to write your request in Greek. 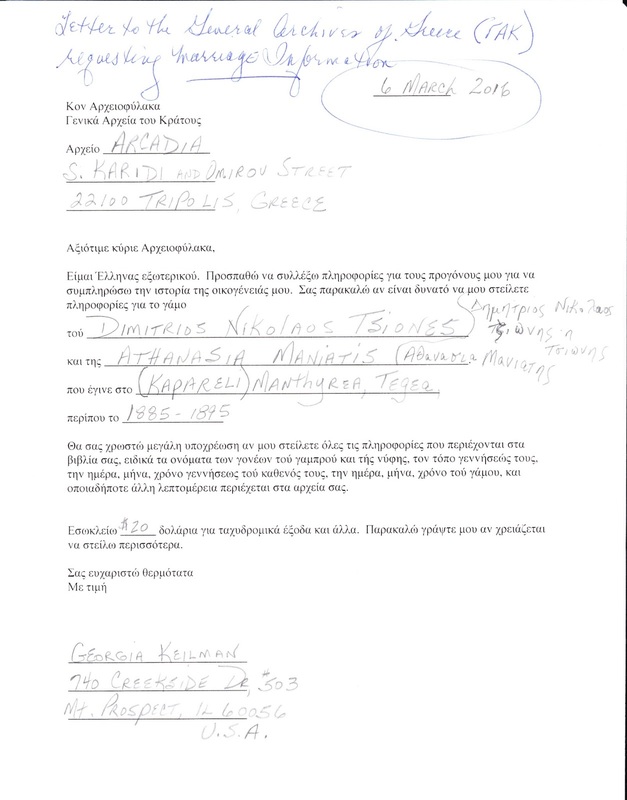 If I do not have a Greek form letter to help me out, I will usually try to write in Greek, apologize for my lack of Greek language skills, and include a duplicate request in English. Can you post a blank Greek copy of the template? Can you please email me at deannawedow@gmail.com? I'd really appreciate it. I have been following your posts for ? years, and you have done a marvelous service for people whose families were from your area by providing so many resources. You have also shared your methods, and I have intently tried to use them for my own genealogy. 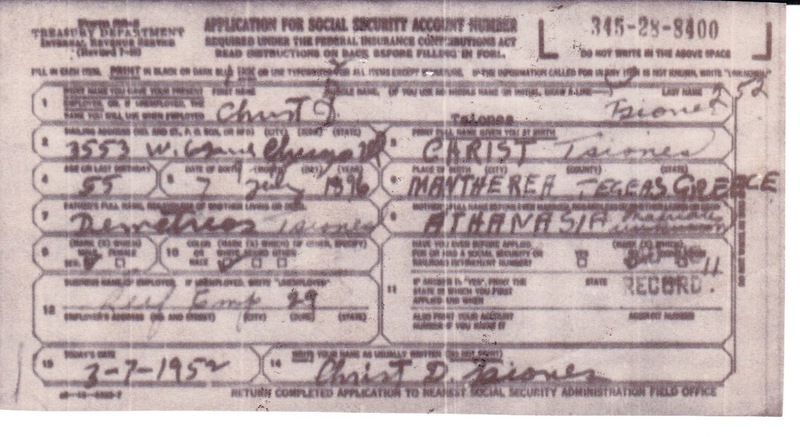 I have a grandfather whose birthplace remains a mystery. The trouble is that the archives require you know the village. 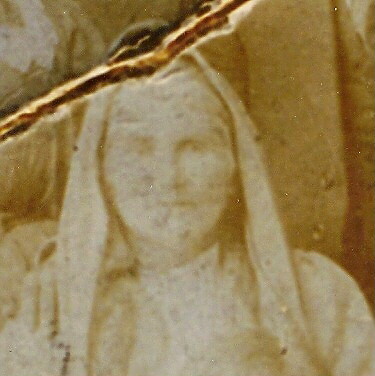 I have been told by my mother and relatives that he was from Kefallonia, but because noone knew the village, I have not been able to confirm that. 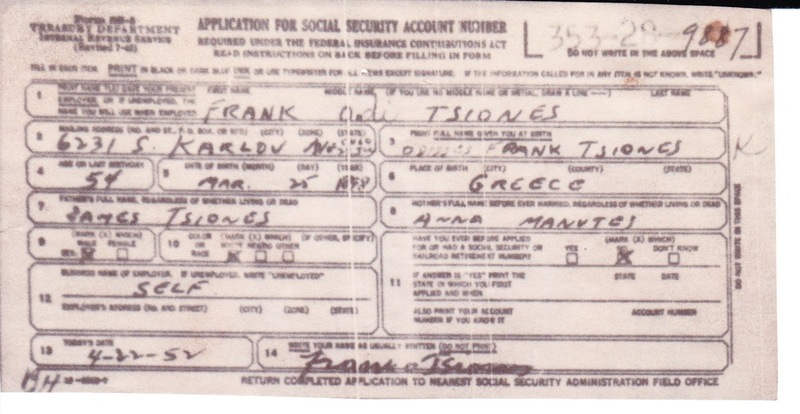 As I dug into my papers, well, he might have been born in Corfu, Crete, Thira, or even Smyrna (Izmir), Turkey. He would have been born about 1879. He moved to Alexandria, Egypt about 1908. 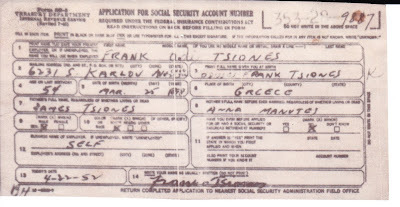 I have looked at the FHL for all the Ionian Islands and strongly suspect he was born elsewhere. Not knowing the village, can you suggest some way to discover the village name? 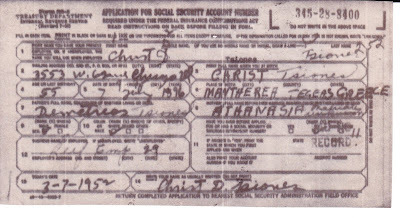 I have searched not only for him, but his father and mother's name as well. I know he had at least two brothers, but I don't know their names. In Santorini, I chose the largest city their and found almost a perfect match, the name was spelled differently (Halikiopoulos, rather than Halkiopoulos). Unfortunately the mother's name was not recorded. Any suggestions?